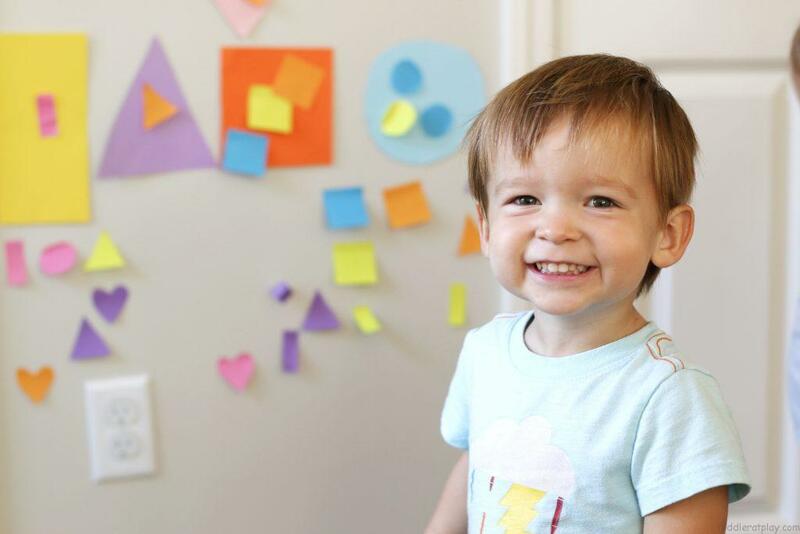 Is your toddler currently learning his or her shapes? 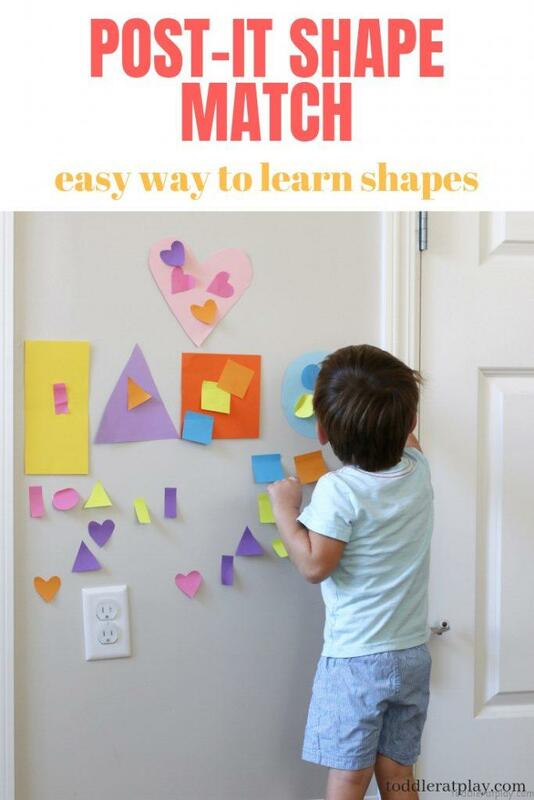 I’ve got a great activity just for toddlers where they’ll learn the shapes and have fun at the same time. This Post-It Shape Match only requires a couple supplies and 5 minutes to set-up! Aren’t activities that are super easy to set-up…THE BEST??? That’s right, I understand you mama. You have housework laying around, cooking to be done and toddlers to keep busy. I am like you. And this is why I like to create crafts, activites and games for young children, like mine and yours, to stay busy and most importantly to keep learning. 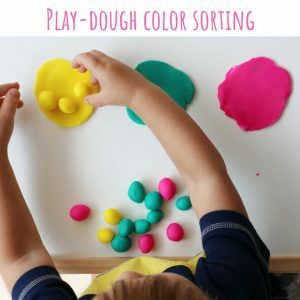 I think you (oops, I mean your toddler) might enjoy this Post-It activity alot, so read on to see how I’ve set it up and you could too! 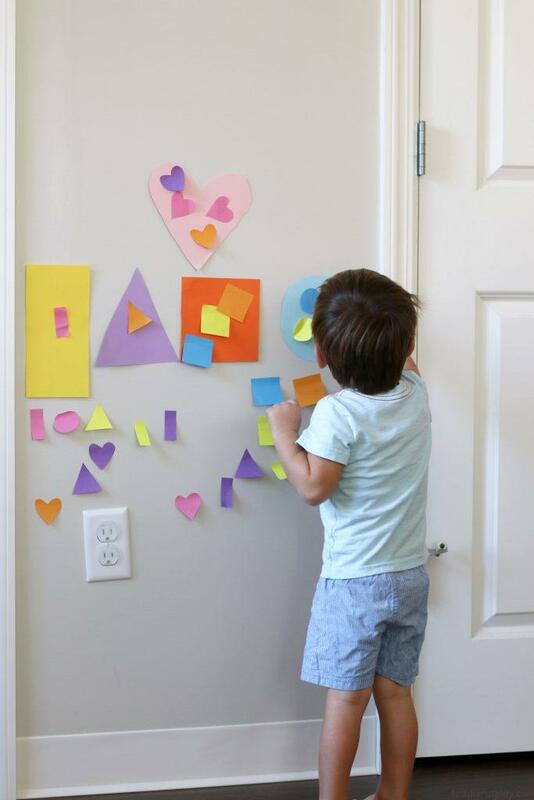 With your craft scissors cut out different shapes for each colored Post-It note. MAKE SURE TO LEAVE THE STICKY PART! I did a hearts, squares, rectangles, circles and triangles. 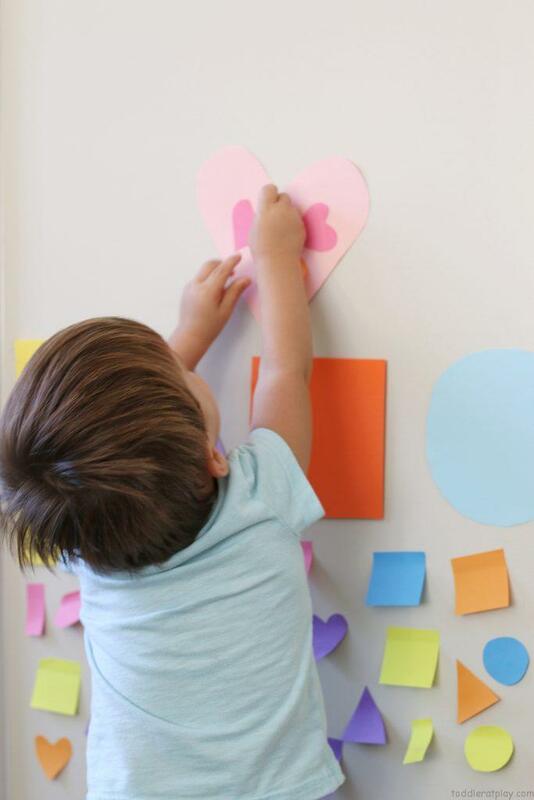 Then, use matching colored pieces of cardstock and cut out each shape that you’ve used for your Post-It’s, make them big. Place some scotch tape on the back and stick onto the wall. Arrange the Post-It shapes below. 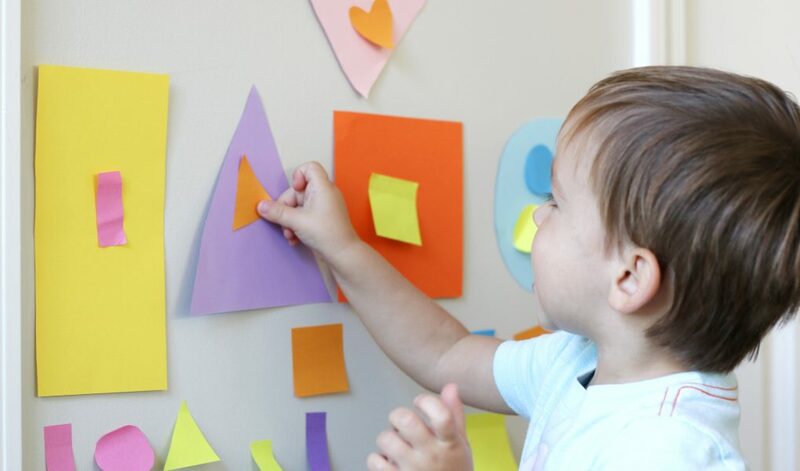 The goal of this activity is for the little one to match all of the Post-It shapes and stick them right onto the big shape. 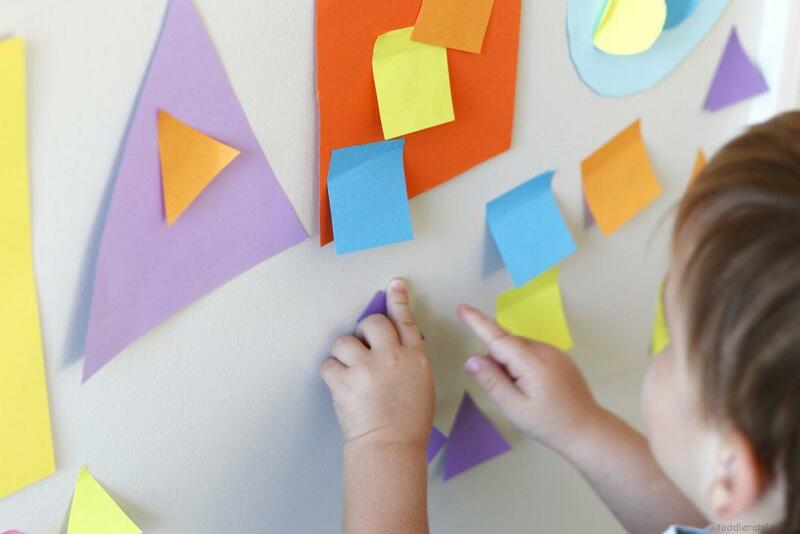 Colors of the shapes can coordinate if you want, it would really depend on the skill level of your child. You’ll see lots of developing going on during this activity. Those wheels will be turning! 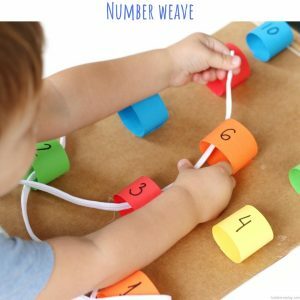 You want to encourage independency during this activity, but help if they’re stumped. My “toddler” just turned 2 and he did this with no problem. I didn’t even know he knows his shapes so well as he does. By the way, if your child can already repeat words after you, name the shapes for your child and ask him or her to repeat them after you. This will help them learn and memorize the names of the shapes too, not to just visually differentiate them. 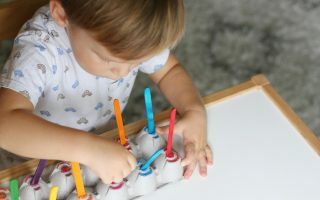 When your child is grabbing the Post-It shapes, he/she is using the pointer finger and the thumb, thus exercising and improving the good ol’ fine motor skills. And another thing I like about this activitiy is that the child is standing and moving around, thats always a plus! Do you have Post-It notes at home? 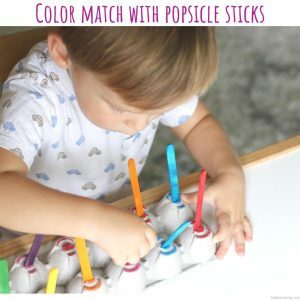 Create this fun activity for your toddler today!